We are a coveted organization, indulged in supplying and trading Friendly Arm11 Board in numerous specifications and configurations. These boards are designed and developed using best quality raw material and cut edged technology as per the predefined industrial standards and quality norms. 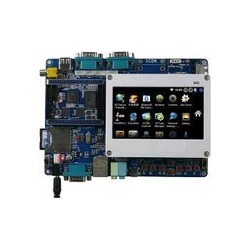 Under this category we offer Friendly ARM Board Mini With LCD, ARM Eleven Board, ARM Eleven Tiny Board and ARM Seven Development Board. 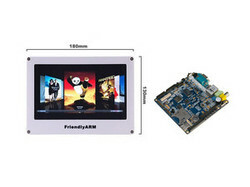 This is a S3C6410 ARM11 development board with a 4.3" TFT LCD. This board comes with a 256MB DDR RAM, 1GB NAND Flash, WinCE / Linux / Android support, advanced Video / graphic support with 3D acceleration. This development board has good documentation in English. Friendly ARM Tiny 6410 Stamp Module with 533 MHz Samsung S3C6410 ARM11 processor.